It was pretty quiet, then all of a sudden there was this huge explosion. Is this a report from a Baghdad street or perhaps the statement from a witness to a gas explosion? No, this is a quote from a story about a water heater that exploded in a Seattle suburb in 2001. The water heater began life located in a restaurant and ended its career more than 400 feet away in the parking lot of a Pizza Hut. Its meteoric traverse took the missile-like appliance over several businesses and a busy four-lane intersection. Four bystanders were injured and several buildings were severely damaged as a result of the concussion. Although not common, water heaters have been known to explode from time to time. Reports in the case of the flying water heater indicated that the pressure relief valve had been capped and the water heater partially drained, the combination of which created a steam explosion. With a few exceptions, most electric marine water heaters are simply scaled versions of those used in homes and businesses the world over. Their components are relatively simple. An electric heating element is immersed in the water contained within the heaters tank. It in turn is controlled by a thermostat that regulates the pressure of the water. When electricity is applied, the heating element warms the water within until the adjustable set point on the thermostat is reached, at which point the heating element turns off. Water heaters also typically include an important safety device, the aforementioned pressure relief valve. This is designed to relieve pressure within the water heaters tank in the event of a malfunction. If, for instance, the thermostat that controls the electric heating element malfunctions and the water within the heater rises to the boiling point, creating steam and the extreme pressure evidenced by the water heater that went to Pizza Hut, the pressure relief valve will open and vent the pressure before the condition goes super critical. Of course, if the pressure relief valve is damaged, malfunctioning, or capped, then it wont be able to provide this all-too-necessary safety feature. Even when a pressure relief valve is working properly it can pose a hazard. Several years ago, while I was managing a boatyard that was responsible for commissioning new vessels, a mechanic was injured by a water heater as he worked alongside it when the pressure relief valve unexpectedly vented, flooding the area with boiling water and steam. Fortunately his injuries were not severe, however, a subsequent investigation revealed that the thermostat had been improperly wired, essentially bypassing its important control function, rendering the heating element continuously energized. 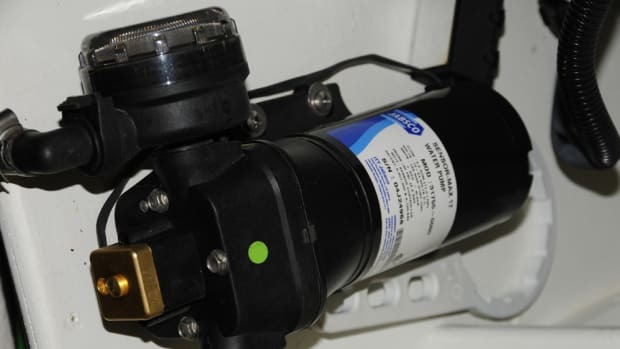 For this reason, the discharge of a water heaters pressure relief valve should be securely plumbed into the bilge or away from areas that may be occupied at any time. Flimsy hose or tubing simply slipped over the valves outlet pipe is inadequate, as it will be blown off by high pressure water and steam. One feature that marine water heaters, for those so equipped, do not share with those ashore is the heat exchanger. The heat exchanger, much like the one on your engine or generator, simply transfers heat generated elsewhere, in the engines closed cooling system or from a diesel-fired hydronic heating system, to the water inside the water heaters tank. This arrangement is extremely common and has been used effectively for decades. Instead of sending all of the excess heat created by the engine out with the exhaust, some of it is reclaimed for washing dishes, taking showers, etc. As well as the heat exchanger scenario works, there are a few caveats associated with its use. Utilizing engine coolant to make hot water means the water heater must become part of the engines closed or coolant-filled cooling system. While most engine manufacturers make provisions for a water-heater connection, when pressed they arent keen on the idea because it takes the control, design, and implementation of the cooling system out of their hands. If the engines cooling system fails because of a design or manufacturing flaw, the engine manufacturer is responsible, provided the engine is still under warranty. If, however, the plumbing between the engine and the water heater fails, the engine will almost certainly overheat and it may do so to the point of self destruction. The engine manufacturer, however, bears no responsibility for this event. Therefore, make certain the hose used to connect the engines cooling system to the water heater is especially rugged, chafe resistant, and robust; hose that carries a J2006R Marine Wet Exhaust rating is ideally suited for this role, while ordinary heater hose, in spite of its name, may not be up to the task because of its propensity to crush, kink, and chafe when routed off the engine and through the vessel. Additionally, its important that when a water heater is connected to an engines closed cooling system that certain protocols as well as the engine manufacturers instructions for such an arrangement are followed closely. Primary among these is the location or elevation of the water heater. If the heat exchanger within the water heater or any portion of the plumbing between the engine and the water heater is located above the engines expansion tank cap, then a remote expansion tank must be plumbed into the system. This tank, with its own pressure cap, then becomes the primary fill point for the closed cooling system, rendering the original legacy fill cap dormant and unusable. In most cases, when a remote expansion tank is installed it must use a pressure cap that the engine manufacturer calls for while the original cap located on the engine must be replaced with a higher pressure rating cap. The reason for this cap swap is to ensure that only the highest cap in the system, the one that can vent air, opens and closes with temperature-induced pressure changes. Another peculiarity of the marine water heater when its interconnected with the engines closed cooling system is the temperature of the water its capable of producing. The traditional, built-in thermostat controls only the electric heating element, which is typically set somewhere between 120°F and 140°F. Its important to note that water heaters are normally set to temperatures above 131°F to prevent development of harmful bacteria, such as Legionella, the cause of Legionnaires disease, in the water supply. This is of particular concern with marine water heaters because they are turned on and off, which means they often contain stagnant, tepid water, which is an incubator of sorts for waterborne bacteria. Water at a temperature above 106°F (41°C) is considered painful to some. Personally, I consider 109°F the perfect shower; my wife believes this is much too hot, she prefers something around 105°F. (Our teenaged children dont seem to care what the temperature of the water is as long as theyve used all of it!) Anything under about 95°F begins to feel chilly. As you can see, theres not much of a range between comfort and pain or potential injury. At a temperature of 131°F (55°C), a child can be scalded in less than 4 seconds. It often comes as a surprise to boat owners that the coolant issuing from the engine and going to the water heater may be as hot as 195°F, perhaps 180°F by the time it reaches the water heater. Without any external control, water exiting the water heater may be nearly this hot, which clearly presents a burn risk. There are two ways this potential safety hazard may be dealt with, both of which offer the same point-of-source approach. The first involves using a mixing or tempering valve. This adjustable device, installed at the water heater, controls the temperature of the water leaving the water heater by mixing it with cold water in order to lower its temperature to the desired level. Therefore, regardless of the temperature of the water in the water heater or the coolant running through the heat exchanger, the output temperature remains constant. The mixing valve has an added benefit, because it enables the water in the water heater to be maintained at a much higher temperature, it effectively provides the user with more hot water for one simple reason: not much of it is needed as its mixed with cold water to produce the desired 130140°F temperature range. Some water heaters come equipped with mixing valves, those from both Indel (indelmarineuse.com) and Quick (quickusa.com), for instance (the latters is optional). Mixing valves can be added to virtually any water heater as an aftermarket item, after which the water heaters thermostat can be increased to maintain a higher pre-product water temperature. Its important to note that not all mixing valves reaction times are quick enough to consider them as anti-scald protection. A variety of standards exist concerning the design and performance of these valves. For more information on this subject, visit watts.com/pdf/pg-mxv.pdf. The other method utilizes a component known as a temperature compensation valve, or TCV, which is plumbed, externally, to the water heaters coolant heat exchanger while sensing output water temperature. This product takes a slightly different approach in that it controls the amount of coolant running through the water heater in such a way that it maintains a water output temperature of about 140°F. These are offered with water heaters, also as an option, manufactured by Kuuma Products (Formerly Force 10), kuumaproducts.com. The beauty of either of these approaches is that they limit the temperature of the water leaving a water heater, regardless of whether the heating source is the electric element or the engines coolant. Quick reacting anti-scald valves are, of course, desirable, particularly for showers and sinks; however, it may not be practical or economical to equip every fixture aboard with one of these, particularly after a vessel is built. Thats where mixing valves and TCVs come in. If your water heater is connected to your engines cooling system youre playing with fire unless you install one of these inexpensive and useful devices. Steve owns and operates Steve DAntonio Marine Consulting, (stevedmarineconsulting.com), providing consulting services to boat buyers, owners, and the marine industry.